While nine newspaper companies burdened with a collective $16.7 billion in debt have sought refuge to date in Chapter 11, the march to bankruptcy court may not be over for the battered industry. Beyond the publishers who already have filed or announced plans to file for bankruptcy, seven publicly traded newspaper companies owe far more money than they should at a time they are confronting a deep and almost certainly prolonged collapse in advertising sales. In a report last week discussing the finances of one of those heavily indebted companies, Fitch Ratings, a private agency that analyzes the quality of bonds for institutional investors, said publishers at this critical point should not have debt greater than one time their annual operating profits. But seven of the publicly traded companies are burdened with debt ranging from 2.9 to 14.7 times their operating earnings. :: Media General owes $722 million, or 7.1x its $101 million in EBITDA in the last 12 months. :: Lee Enterprises owes $1.2 billion, or 6.7x its $174 million in operating earnings in the last 12 months. :: McClatchy owes $1.9 billion, or 5.6x its $347 million in operating profits in the last 12 months. :: Journal Communications owes $172 million, or 3.1x its $56 million in trailing EBITDA. :: New York Times Co. owes $917 million, or 3.0x its $306 million in operating profits in the last 12 months. :: Gannett owes $3.3 billion, or 2.9x its $1.2 billion in EBITDA in the prior 12 months. By contrast, the debt-to-EBITDA ratios are 0.8x at E.W. Scripps, 0.5x at Washington Post Co. and zero at A.H. Belo. The top executives of all of these companies, as well as most of the privately held publishers whose financial information is not available for analysis, are fully aware of the danger of too much debt and are taking steps to reduce the leverage of their businesses as fast as they can. Those steps include cutting expenses to raise profits; renegotiating debt to reduce the amount to be repaid; extending the deadlines for when debt is due, and, in some cases, trying to sell assets to raise cash. McClatchy, which is the company discussed in the Fitch report last week, has done all of the above. While praising the company for trimming $3 billion in debt and boosting it profits through aggressive cost cutting, Fitch nonetheless concluded that McClatchy still has an “untenable capital structure” that could lead to an eventual default. The inability to keep up with too much debt is what propelled six of seven newspaper companies into bankruptcy court as of the end of 2009. The seventh company, the Sun-Times Media Group, filed for bankruptcy even though it had no debt. That’s because it was on track to lose $381 million last year but had no more than $100 million in cash in the bank. 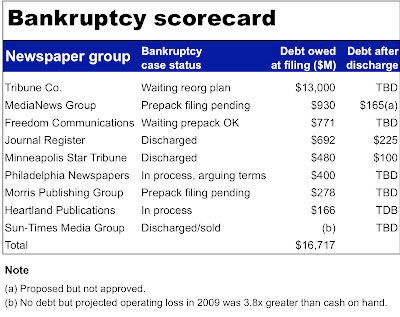 As you can see in the Bankruptcy Scorecard below, the Tribune Co. default overwhelmingly dwarfs all the others. Tribune buckled under $13 billion in obligations just days short of the first anniversary of its reckless acquisition by Sam Zell, who put less than $350 million of his reputed $3 billion fortune into the deal. Three publishers already have been discharged from bankruptcy. The Sun-Times Group was sold to local investors, who promised to return the business to profitability. The other two were Journal Register, which was permitted to shrug off two-thirds of its debt, and the Minneapolis Star Tribune, which off-loaded nearly 80% of its debt. While all of the discharged companies will have to work hard for their money in this uncertain economic environment, they will have an easier time of it than the publishers still saddled with far higher loads of debt. Less debt gives a company the financial capacity to put more money into improving existing products or developing fresh print and interactive initiatives to unlock new revenue streams. Given the ability of the bankruptcy process to magically make life easier for a publishing company, you have to wonder why everyone doesn’t do it. One reason, of course, is that it is embarrassing for any chief executive to admit he or she made the mistake of encumbering a business with too much debt. Another is that a great deal of any top executive’s compensation is conveyed in stock, not cash. Bankruptcy almost always wipes out the entire value of a company’s stock. And a final factor may be this: The debt holders stiffed in a bankruptcy usually get a vote on who will run the company after it is discharged. In the cases settled to date, the CEOs responsible for the moves that led their newspapers into bankruptcy were gone when their companies emerged. One option for debt-plagued companies that you don't mention is to turn debts into equity or stocks. It dilutes existing stockholders and so doesn't favor the stock holdings of newspaper execs. But I have been expecting it, and we see what it looks like in Billy Dean's bankruptcy move, which turns debt into stock. More important then EBITDA to debt ratio is asset to debt. In my experience in a well run company it should be between 40 to 70%. If it has assets it can do a lot for example it can raise money, it can sell off assets etc. I wonder if in a future article, maybe you could give us this ratio. One issue with using asset-to-debt: What's the value of those assets? That's not as trivial as it sounds. There's simply no liquid market for dailies (or even TV stations) right now; those that have sold have been at desperation-sale prices. People were begging for the chance to buy the San Diego Union-Tribune for $1 billion five or six years ago; it ended up selling at the bottom last year for less than $50 million. Alan's beloved Sun-Times went for only $25 million. That's one reason why all those mid-00s deals that looked great at the time are sinking the balance sheets now: writedowns. In that kind of market, how do you value the assets? What could Lee get for St. Louis, for example? Any number you put on it would be a weak - and depressing - guess. This Tom is a problem faced by all businesses. Still these *guesses* are done all the time. I suppose the answer in this context it depends on what banks and shareholders are willing to pay for these assets now. > into equity or stocks. The problem with that is that stock in a company is worth something only if the company has a reasonable chance of returning to profitability. I.e. acquiring stock is a bet on the company's future. It was a good option in GM's bankruptcy, and even for Ford re-capitalizing itself through less extreme measures. Global auto sales are recovering, and are expected to continue to recover. The newspaper industry, however, appears to be going the way of the horse and buggy. Newspaper ad revenue peaked in 2005, well before "The Great recession", and have continued their power-dive. Stock in a newspaper is *NOT* worth much these days, with a few niche exceptions. And those niches do not include major metro daily chains. Where are all the front-page ads? How long can publishers afford to print? How long can print newspapers last?